This is a book that really does have something to offer to everyone. A collection of works from various writers and artists, Rookie on Love is packed with a variety of recollections, observations, poems, and even comics, regarding the topic of love. Considering I focus so much on reading fiction, it was refreshing to pick this one up and enjoy something different. Despite the book revolving around love, it's not just focused on romantic love. Whilst there are stories of heartbreak and love gone wrong, it also explores family dynamics, our relationships with our friends, and even the love we have for our pets. With relatable writing throughout, there's bound to be something within these pages that you can relate to a little. This gorgeously designed book has adorable illustrations throughout, which make it even more special. The comic strip pages were an unexpected surprise that I adored! Especially, OMG, Yay! which focused on small, positive parts of an average day that can make us happy. It's such a cute idea that me smile. I won't lie, my favourite work within Rookie on Love is Willis, a devotional to dogs. It's only a few pages long, but it really makes you think about the love our pets have for us, and how much their lives revolve around our decisions. It made my emotional, dog-loving self go and give my own dog the biggest of cuddles. Do Sisters Actually Love Each Other? is an interesting piece about sibling relationships and how they evolve. The fact that it's told via text was interesting and made it even more fun to read. I also loved Binary Planets, in which twins Ogechi and Ugochi discuss their experiences growing up. It was fascinating to take this sort of look into the lives of others. Another one of my favourites is the conversation between Rainbow Rowell and John Green about writing teen love. It was great to read their thoughts about why they write their love stories the way that they do. Other highlights include a poem by Florence Welch and a piece by Alessia Cara on learning how to love herself first and foremost. 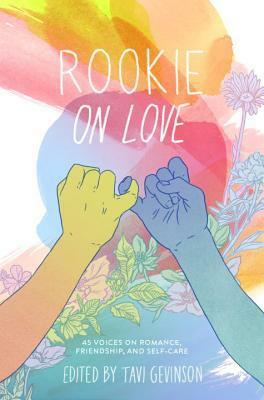 With such an interesting bunch of pieces from a wonderfully diverse set of contributors, Rookie on Love is the uplifting read that I needed. It's one that can be picked up and delved into anytime, and one with works I'll be sure to go back to and read over again in the future.